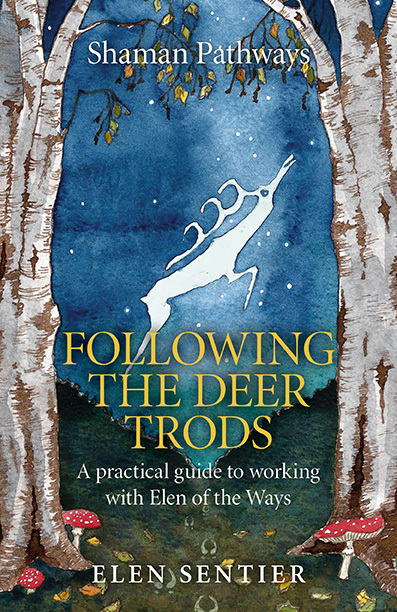 This Shaman Pathways book from Moon Books provides an introduction to the subject of the Awenydd, the Brythonic shaman working with the goddess Elen of the Ways. The author herself is an Awenydd, it having been in her family for many generations. Sentier’s words are clear and very informal – it’s as if you’re having a chat in your kitchen with a cup of tea. She won’t dumb it down for you, neither will she make it impossible for you to understand – she uses the vernacular throughout. As a Shaman Pathways book, it has to provide an introduction to the topic in about 100 pages or less, which is quite difficult in any subject. In this book, Sentier does it quite clearly and concisely. I also found kindred alliance with the concept of the Awenydd being one that is in service to the community, rather than focusing on the concept of personal development. For me, this is what Druidry is all about. We can begin with the self, but it must not end there. As Sentier points out, “In the British tradition our [awenyddion, the plural of an awenydd] primary goal is to help the Earth and in order to do this we learn to ask her what she needs rather than thinking we know best”. Sentier also brings forward the concept that the healer or awenydd is not one that cures, but rather the one that uses a holistic approach, literally makes things whole. This may not include a cure, but it takes into consideration all aspects of healing. My only criticism of this book is that the author tends to write in an anti-Christian tone every now and then, which I find off-putting. Having Christian family as well as Christian, Jewish and Muslim friends, and also working with Christian Druids I sometimes find remarks like “cruelty seems to be an integral part of all three of the Religions of the Book (the Bible) Christianity, Judaism and Muslimism” a little hard to bear. Indeed, the second half of the Bible deals with the teachings of Christ, which are mainly about love, not cruelty. Cruelty is not specific to a religious creed. The author’s rather low view of Christianity, in my opinion, is not conducive to getting the message across in a positive and peaceful way, all things considered. This is really a book that is jam-packed with really useful information, exercises and different ideas that aren’t really found elsewhere. If the delivery hadn’t included the author’s views on Christianity, I would be happy to recommend it to anyone. However, considering some of the words said throughout the text, I could not recommend it to anyone who follows any of the three Abrahamic faiths alongside their own Paganism. This entry was posted in Book reviews and tagged awen, awenydd, book, druid, elen, elen of the ways, elen sentier, goddess, moon books, pagan, pathways, religion, review, shaman. Bookmark the permalink. I cannot see the reviewers name and, of course, most people writing books or otherwise do not deliberately set out to offend. However, we do still have the privilege of freedom of speech in this country as this reviewer has just exercised! I thoroughly enjoyed the book as a Pagan and a campaigner for Interfaith groups. Mollie.